Alzheimer’s can steal many things, but my mom’s gentle, kind soul and love will always be there. "My beautiful mother has been a victim of robbery. Not just a “man with a gun, hand them the note, and take all the money” kind of robbery, but a silent, relentless, and horrible robbery. A theft most cannot even imagine, a traumatic ordeal I have a hard time believing, and that on a daily basis I am reminded of and struggle to comprehend. Yvonne Jensen, my mother, spent most of her career life working in the field of banking in one form or another. She started out as a teller with First Western Bank in Tonopah, NV. She also worked for California Federal and Nevada State Bank in Sparks and Reno, NV. She worked in management and supervisory positions as her career advanced. She was a good banker. One of the things all bankers have to be aware of is the chance of a robbery. It is one of those things you have to be prepared for but hope never happens. Well, during all the years my mom was in banking there were a few times her branch had robbery situations. One time was one of those situations that you just never imagine will happen. The kind of situation you only see in movies, but this kind of violent bank robbery actually did happen to my mom. A very vocal, violent, and aggressive bank robber came into her branch with a hand gun demanding money. He actually held the gun to my mom’s head while screaming at her to give him money or he would blow her f***ing head off. This robbery was very traumatic for my mom, to say the least. Luckily the man got what he wanted and left without harming anyone. For some reason, I will blame it on God, as I sat at a drive-in movie theater late one summer night in 2011, this event kept circulating through my mind. I had been contemplating all my mom had experienced in her life, not just this traumatic event, but all the trials and joys life had dealt her. I was particularly perplexed by what she was facing now, and what my part in her life was and will be. Then suddenly, as I sat there in the dark, I realized my mom was being robbed again. Right at that very moment as I sat with my family I understood my mom was a victim of a vicious and cruel robbery . . . Violated and robbed again and I just knew I needed to tell her story. God connected the pieces of the puzzle for me and I felt so strongly that I need to speak out about this theft my mom was and is experiencing. You see it isn’t a man with a gun robbing her, it is a disease called Alzheimer‘s. What is slowly being stolen from my mom are her memories, her essence. Think about this, really think about this, what is life? What does life really mean if you don’t have memories? What would your life be like if you didn’t remember the day your children were born? Many adults tend to joke as they get older that their birthdays are just another day on the calendar, but what if that were really true? My mom no longer knows that May 27 is her birthday. What if you didn’t know what day of the week it is or what month it is ever again? What if you couldn’t remember how to do something as simple as tying your shoes, writing a sentence, turning on a TV, or using a phone? I know for all those that haven’t known my mom long it might be hard to believe, but the person my mom is today is a very simple shell of the person I once knew. She really is nothing like herself. Each and every day my soul hurts, I feel a sadness like I‘ve never felt before, and a part of me feels hollow. I have a very hard time looking at my mom, looking into her eyes, because the person I see looks like my mom, smiles like my mom, sounds like my mom, but I am devastated to say, my Alzheimer’s mom is a very different person than I have ever known my mom to be. My mom, who was once brilliant with numbers and harped on me to keep my check account balanced, can no longer keep her accounts in line, write a check, tell the time or know what the date is; she can’t add or subtract, or do any other task involving numbers. Alzheimer’s has stolen her brilliance with numbers. In her living space hang beautiful oil paintings and ceramic paintings. Any thief would definitely steal them right from the wall, but my mom’s paintings weren’t stolen, her ability and desire to paint is gone though. Alzheimer’s has taken that. The amazing talent for painting that she displayed throughout her life is gone. Another amazing talent my mom had that has be stolen is the gift of sewing, quilting, crocheting, and creating textiles. She was so incredibly talented in this area. Luckily, I have many items to remember just how talented she was. There is the most special item she made hanging in the closet, my beautiful wedding dress. I feel blessed to have my dress and hopefully one or both of my daughters will like to wear it one day. Then there are the hand made Raggedy Ann and Andy dolls, the swan, Christmas ornaments, other clothing pieces, blankets, and the heirloom quilt she made from the quilt blocks left to her by her grandmother. 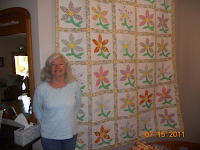 This quilt was finished in 2008, luckily, as it was shortly after that Alzheimer’s stole her ability to sew and create. Like a thief in the night, Alzheimer’s has come quietly and grabbed a hold of the very essence of the person my mom was and stolen her away. Her memories are slowly being stripped away fading each day, her decision making abilities are long gone, her social graces come and go, her recognition of special occasions or people has vanished. Gone are her abilities to care for herself and others. Gone is that light that shines from a person that is joy-filled and vibrant that recalls all the many threads of life that have created her own personal tapestry. For my mom, the threads of her tapestry are frayed, with gaping holes that grow larger each day. The threads that can never be broken though, are the threads of my love for her. Her love will never fade either. Although my mom has been changed by Alzheimer’s she is still my mom and I will do the best I possibly can to care for her the rest of the days of her life.